Hope everyone is enjoying the summer, it’s going so fast which makes me sad because I am a summer girl, but also excited because it’s getting closer to the release of my new cookbook, Skinnytaste One and Done which comes out Oct 9! For those of you who pre-ordered, you can get 4 free recipes from the book now, with your pre-order. More details here! And just a friendly reminder, to receive my new recipes or meal plans via email, make sure you’re signed up for my email subscription (it’s free!). It’s also my wedding anniversary Sunday, we are celebrating by spending a night in the city at the Lotte New York Palace (gorgeous hotel!) and dinner with friends at Il Mulino (first time!). * Freeze remaining 8 ounces baguette and defrost on Sunday for pizza. ** If you can’t find Za’atar, use a blend of thyme, sesame and salt. Loving the meal plans, thank you! My Mother-in-Law got me hooked on your site. I’ve even gotten my picky hardly any veggie kiddo excited for all the new recipes. She absolutely loved the zucchini lasagna rolls. Bonus I haven’t been in a cooking rut all summer unlike last year. thank you so much for these meal plans! they make my life sooo much easier! We feel healthier and love trying new recipes!! Omg please don’t stop! I just found these!!!! Meal planning is my least favorite chore. Please keep making weekly meal plans so I can use my time for things I like way better, like playing with my kids! Love your plans! Make my life sooooo much easier!!! Thank you for sharing!!! 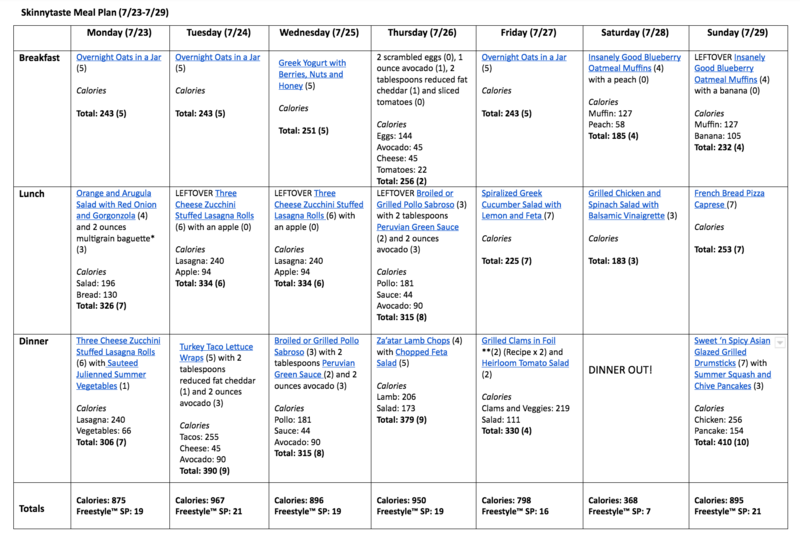 Thank you so much for posting these meal plans! I have been using (and loving) your recipes for a while, but this is my first week using the plan. It was amazing not having to piece together all of the meals, and my family has enjoyed everything so far (which is no small feat!). Thanks again for this awesome resource!! Hello! I made your Insanely Good Oatmeal Blueberry Muffins, and they ARE insanely good! When I did the points calculation with my app it came up as 6. The recipe says 4 points. Which is it? Please keep the meal plans coming! I’m semi new to weight watchers and I’m tired of the same old things I’ve been eating. Thank you so much! Im new to Skinnytaste…and am blown away with the effort, imagination and yummy talent in its design! The planning and ease of design has solved any dilemmas I’ve “used in the past” to fall off the wagon! I hope you know how much your efforts are helping this NYC Texas transplant, and all others within the reach of your website! love all your recipes have made so many and have been using since january of 2018, my all time favorite is the turkey chili soup!Thanks for sharing and keep them coming! I LOVE your meal plans lady!!! They’re just what I need right now to get back to a healthier lifestyle with very little to plan! You’re a lifesaver and I can’t wait to get your next book! Are these meal plans based on servings for more than one person, could they be used to feed a family of four? if not are they adaptable for a family style meal? Thanks so much for these recipes. I use them weekly and love the flavors of the food. Keep them coming!! Gina, I have been using Skinnytaste recipes for a while now and I own Fast and Slow (love it). Everything I have made I have found to be doable and delicious. I wanted to let you know that today is the day I am committing to use the meal plans as written, to help kick me back into meal planning mode and good organization for my family’s benefit and also for my own health and personal goals. Thank you so much for all of your efforts to make this site so easy to look at and use! :) Here’s to a new day! Wonderful Website….really enjoy your recipes, yes please continue!!! I love the menus and the recipes. I do hope you will keep sharing! Your meal plans are super helpful! I couldn’t find the grocery list this time. Help! Also do you shop just once a week? I love your recipes and meal plans! They make it super easy to grocery shop and makes dinner time a lot less annoying and stressful cause I already know what I’m making. Thanks!! My husband and I have been cooking from your recipes since 2013. Your site changed the way we viewed cooking and meal planning, and the recipes helped a lot when we were budgeting through his law education. Lately, we have felt like we’re in a rut with our meal plans so we turned to your site yet again. 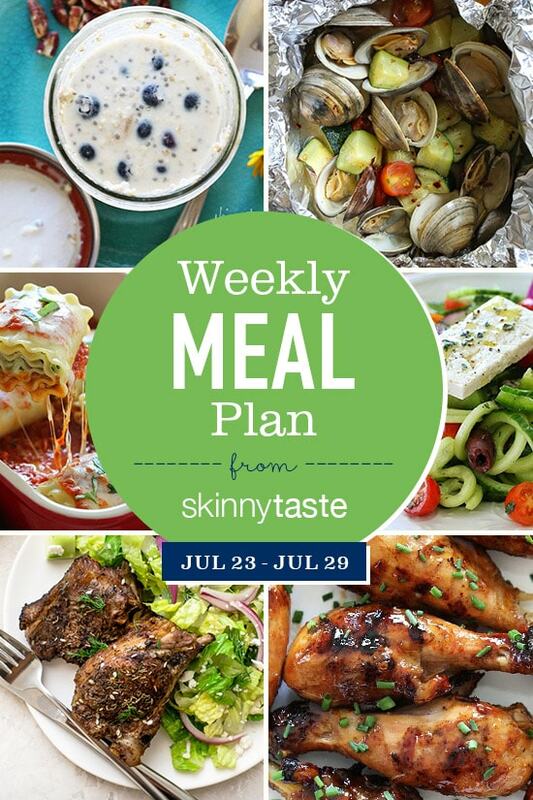 Your meal plans have taken the guesswork out of the week and we are trying so many new recipes. Thank you for all that you do! I refer to your meal plans. They are helpful, even if I don’t follow them exactly. Please keep sharing. Love your recipes and books! The calculator (“Supertracker”) you provided in the link has been discontinued is there anything else we can use? Il Mulino is the best!! You’ll be full before you even order food. Happy Anniversary—enjoy! !